Product #16683 | SKU KOPROPLUS | 0.0 (no ratings yet) Thanks for your rating! The Kaossilator Pro+ from Korg is a performance interface that features an XY touch pad and four loop record buttons that can be set up for loop recording of four measures (16 beats) each. The controller allows the user to play musical melodies and phrases by simply stroking, tapping, or rubbing the touchpad. Horizontal motions on the touchpad control the pitch, while vertical motions control the tone, including filter cutoff, feedback, or modulation depth. Each of the four loop banks can be muted or un-muted, its volume adjusted, and its loop length changed, and the four banks can be combined for virtually infinite performance possibilities. The intuitive design of the touchpad is particularly appealing to non-keyboard players, although performances can be created on the controller that could not be produced on a conventional keyboard instrument. Key and Scale features ensure that notes being played will match the song being performed. The Key setting specifies the root along with a choice of thirty-five scales encompassing chromatic, major pentatonic, and minor blues, as well as others such as Spanish, Ryukyu, and Raga. By using both the Key and Scale settings perfect solos can be played without a single wrong note. The Note Range allows for specifying the range of playable pitches. A total of 250 sound programmes (including drum programmes) cover a wide range of styles including hip-hop, chiptune, house, dubstep, new disco, electro, reggaeton, and drum 'n' bass. Built-in gate arpeggiator patterns can automatically generate phrases and beats by simply moving a finger across the touchpad, while using the slider changes the gate time and gate speed in real time. The pad LEDs light up along the path of the finger, useful when playing on a dimly lit stage. MIDI In/Out jacks and a USB port make it easy to control external MIDI devices. Loop data and user settings such as programmes can be stored on an optional SD/SDHC card. 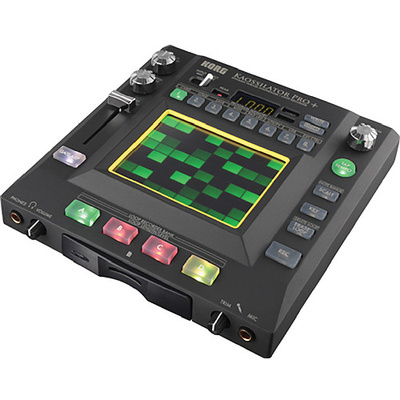 A downloadable Kaossilator Pro+ Editor provides librarian functionality for any loop data as well as functioning as a MIDI assignment editor. Finally, data is interchangeable between the Kaossilator Pro+ and the Kaossilator 2, sharing BPM and other settings.